Arrow Sewing Cabinets: 16,000 Fans Means It's Gidget Time! 16,000 Fans Means It's Gidget Time! Hello Everyone! We went over 16,000 fans on Facebook, so that means it's time for a Gidget Giveaway! Since we have so many new friends, we want to make sure that everyone understands how the giveaways work. In order to be included in the random drawings for our weekly swag giveaways and the giveaways we do when we gain fans on Facebook, you must be registered. However, you only have to register ONCE. If you have registered with us since our big "Sewing Suite Giveaway" when we hit 10,000 likes in April 2014, you don't have to register again. If you haven't registered with us, you will need to sign up by clicking on the purple "Sign Up for Our Giveaways" block located on the left side of our Facebook page. If you can't remember if you've registered or not, just try to enter your info. If you have already registered you'll get the following message: "An entry with this Address/Email has already been recorded". That means you're all set! Please note - do not try to register with multiple emails. As we have done in the past, duplicate entries will be deleted. Our giveaways are open to residents of the United States and Canada. * We'll be drawing a name on Monday, 3/31/15, so make sure you're signed up! Good luck everyone! I have a machine waiting for a cabinet, would love this beauty! Thanks for the chance. going to be a special day for one lucky person.... good luck to all. Are employees of dealerships allowed to enter? If I were fortunate enough to win, I would give the Gidget to my sister for her birthday in May. It would be sew perfect in her condo. Thank you Arrow! this would be the most awesome birthday gift ever!!!!!!!! Thank you so much for this chance to win a Gidget! Thank you Arrow Sewing Cabinets!! 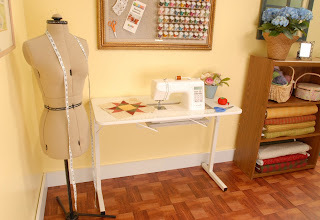 Wouldn't this be a cool addition to my sewing area! Kiss The Blarney Stone and Win a Florie!